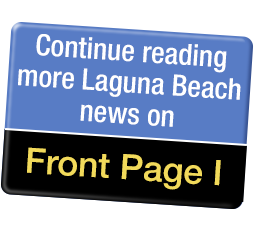 Laguna Beach schools have benefited greatly from the efforts of countless people. From administrators to teachers to volunteers, in grand initiatives and small daily gestures, so many people have contributed to making Laguna schools a source of pride in the community. And while this is nothing if not a group effort, there are certain individuals who make a singular difference. Lynn Gregory, the Laguna Beach Scholarship Foundation (LBSF) coordinator, is such a person. Or, perhaps it is more accurate to say, she “has been” such a person, since Gregory is leaving the district she loves, not to mention the country she loves, for Budapest, Hungary. Gregory has been a fixture at three of Laguna’s four schools for close to 20 years: El Morro, Thurston and LBHS. She and her husband Scott moved here as newlyweds in 1994. They looked at other places – Corona del Mar, Seal Beach – but chose Laguna, even though what they could buy needed some work. “We could afford tar paper and plywood,” she says with a laugh. But they remodeled and started their family. “It has been our home ever since. I’ve never lived in a place where a community becomes your family. Maybe because we didn’t have any family out here…” she muses. When her oldest son started at El Morro Elementary, Gregory began volunteering at the school. “It was Melanie Lewis’ fault,” she laughs. Lewis was El Morro’s PTA president at the time, and she knew a good thing when she saw it. “I just jumped in,” says Gregory. “I loved the connection with the parents. I fell in love.” She began to take on more and more responsibility until she herself was PTA president for two years. And she left a legacy with programs and practices that are still being used today like Character Counts, Strike Team, Spirit Wear, as well as getting a teacher’s lounge, and helping make changes to Boo Blast so that it became a successful fundraiser. Lynn Gregory, Laguna Beach Scholarship Coordinator and volunteer extraordinaire, is stepping down. She and her husband will be moving to Budapest, Hungary in November. “My husband tells me I have a problem with boundaries,” she says with a laugh. “He’d say, ‘Remember, you’re a volunteer.’” While his hints were acknowledged, they were also ignored. Gregory simply can’t do anything halfway. That’s why she finally retired from her job as a flight attendant when her oldest son was in fourth grade. “I had to choose a paying job or PTA president,” she says, laughing as if there was any other choice she could have made. And she continued to make that same choice when her boys moved on to Thurston, again helping to implement PTA programs that are still going strong today like the Epic Challenge and the Sports Swap. And she still wasn’t done, dedicating even more time and energy to SchoolPower by chairing its Dinner Dance for several years and serving as president. Gregory is quick to pile the praise on others. If you talk to her you’d think she was merely a bystander to all of these things. She credits the many people she has worked with and, more importantly, her faith. “I believe that my desire to serve is a direct correlation to do what I am called to do,” she says. Luckily, I have seen Gregory’s effectiveness first hand so I can vouch for her efficacy. Gregory is from the south. Despite her years in California, she has not lost her southern charms, and she’s not afraid to use them. If you should find yourself in Gregory’s very elegant, double-handed handshake, there is a very good chance you will find yourself agreeing to do something you had absolutely no intention of agreeing to. And she will make it seem like it’s all your idea. Gregory continued her volunteer efforts even after she got the job with the Scholarship Foundation, but the fact that she got the job to begin with was a bit of a surprise. First, she was made aware of the position on the last day of the job posting. “We were traveling,” she recalls. “I didn’t even have a resume.” But it sounded intriguing enough that while in the airport lounge, she dictated her work achievements to her husband who wrote them down on a napkin and then into a workable resume. “Lo and behold, I was hired,” she marvels. She did ask her boys for their blessing. “I didn’t want to encroach on my kids’ territory,” she says. They were unanimous in their support, although looking back Gregory thinks their support was more practical (easy access to lunch money) than selfless. Regardless, she took the job and has been the LBSF coordinator for the past six years. The LBSF acts as a liaison between scholarship donors, LBHS and its students. In addition, it develops funds, manages the scholarship application process for students and provides oversight of managed funds. It is governed by a Board of 30 volunteer trustees, and anyone is welcome to become a trustee. Gregory works for LBUSD and is tasked with coordinating with the donors and the students. She will miss it, but she’s looking forward to this new phase in her life. “I’m excited for the adventure,” she tells me. “It’s a perfect time.” Her boys are out of the house and the former flight attendant is one who has always loved an adventure. “My mom used to say ‘Where the wind blew, Lynnie flew,’” she says. The wind has come up again, and is blowing the Gregorys halfway across the world. “I’m looking forward to spending time with my husband,” she says. And there is a city to master, cooking classes to take, and a very foreign language barrier to try and overcome. “I suppose I’ll give it a try,” she says gamely of learning Hungarian. “But the street signs are crazy!” And because she is who she is, Gregory has already reached out to several international schools to see if they need any assistance.